King Mohammed VI of Morocco and French President Emmanuel Macron proceeded Thursday from the revamped railway station in Tangier to the official launch of Africa’s first high-speed train. The two leaders were offered the first two tickets of the brand new high-speed train before they boarded on an inaugural journey to Rabat. The train will slash by two-thirds the travel time between Casablanca and Tangier to 2 hours and 10 minutes compared to 4 hours 45min by a regular train. The Casablanca-Tangier 200 km high-speed link is the first phase in a project that will stretch through 1500 kilometers, connecting Marrakesh and Agadir, two of Morocco’s tourist hubs. The high-speed railway was built at a cost of €2.1 billion (about 23 billion dirhams). 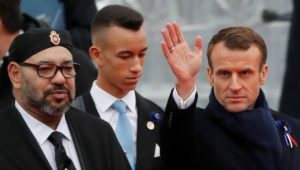 France offered 51% of the funding while the rest was provided by Morocco and several Arab friendly countries’ funds, namely Saudi Arabia (€144 million), Kuwait (€100 million), Abu Dhabi (€70 million) and the Arab Development Fund (€86 million). The TGV “Al Boraq” has an initial capacity of 523 passengers. The capacity will later be increased to 1,064 passengers after the construction of a double-track line. When the project reaches its cruising speed, the Moroccan state-owned railway operator, ONCF, expects to operate 15 daily departures to and from Tangier and Casablanca, and believes the number of passengers would grow to 5 to 6 million a year after three years of operation. The average occupancy rate is expected to reach 70%. Since the King took the throne in 1999, some 70 billion dirhams were spent to develop Morocco’s railways. Written by: Jaber Ali on November 15, 2018.